The author took this 15-pound bulldog on a green crab while fishing in a boulder field aboard the Orient Point, NY charter boat, Nancy Ann IV. Photo by Capt. Jerry McGrath. Three fast, light taps signaled something was investigating my bait on the rocky bottom some 40 feet below. For an instant, I considered setting the hook but decided to pass believing the taps to come from pesky bergalls or small sea bass. I was looking for bigger game, a bulldog blackfish of 6 pounds or more, and I was willing to wait. Tap, tap, tap; another round of quick hits. I passed again and waited some more. An eternity seemed to slip by, well two or three minutes anyway, before the next tap. Then I felt a substantial tug – the heavy and deliberate calling card of a quality blackfish. In one swift motion I set the hook and raised my arms high overhead as the stiff boat pole took on a big bend. Immediately the fish tried to bull its way back down into the snags below but I continued to hold the rod high and gained several quick cranks on the reel. The tug-of-war that ensued lasted only a few minutes, but it was a knockdown, drag-out battle before I could swing the feisty 8-pounder over the transom. Like most lunker blackfish fights, this one was reminiscent of the famous world title bout between Thomas “Hit Man” Hearns and “Marvelous Marvin Haggler”; a short, sweet, powerful slug-fest. Blackfishing is one of those intangible lines that separate the wannabees from the real fishing experts. Learn to catch blackfish consistently and you can learn to catch any other fish in the sea. Show off a couple of bulldogs and nobody will question your angling ability. The words “luck” and “blackfishing” are rarely used together while “skill” and “blackfishing” are frequently linked. Although it may sound intimidating, blackfishing can be a blast once you get the hang of it. Just figure that, in the beginning, you’ll have to earn every fish. Be aware, however, that once you catch a few, it isn’t hard to become a blackfish fanatic. You’ll know you’re hooked when you pass on breaking bass and bluefish en route to some rough and tumble bottom. In early to mid-October, blackfish are often found in water depths of less than 30 feet. 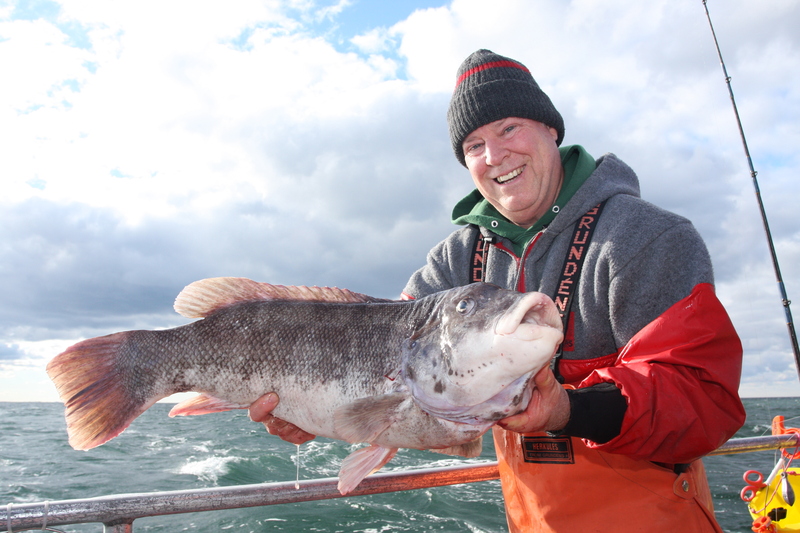 Here’s a Throwback Thursday shot of the author and “Crazy Alberto” Knie tugging ‘tog in western Long Island Sound. OutdoorTom.com photo. The keys to finding blackfish lie in water temperature and structure. 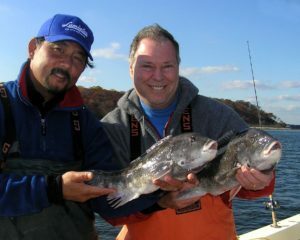 Most anglers are aware that blackfish love to hang around underwater obstructions and rocky bottom, but they frequently fail to consider that “tautog” or “’tog,” as New Englanders call this member of the wrasse family, also prefer that the water range between 50 and 60 degrees. To stay in this range the fish move inshore and off throughout the season, coming to the shallows in spring and fall and holding deep during summer and winter. In most areas, the inshore fall run peaks between mid-October and Veterans Day. Blackfish relish snag-infested “live” bottom that hosts an abundance of crabs, mussels and baby lobster. When the tide is slack, the blacks hide within crevices, holes, depressions and cut-outs. As the tide begins to push, they take up feeding positions at the head and along the lead outside edges, scoffing up tasty morsels like green or calico crabs that get caught in the current and tumble past. At the height of the tide, the chunky-shaped blacks tuck inside or behind structure to get out of the current, returning to their feeding stations as the tide relents later in the day – thus their reputation for feeding best at the start and end of a tide, when currents are generally mild to moderate. Since ‘tog rarely wander more than a few yards from structure during their feeding forays, it is vital to anchor-up so that your baits will touch down within a few feet of a boulder, wreck, mussel hump, bridge abutment or whatever is holding the fish. 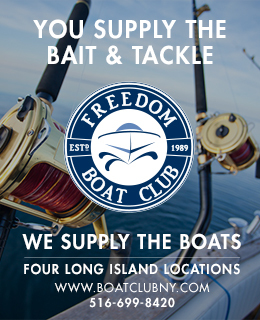 For this reason, experienced blackfishermen usually double-anchor their boats from the bow and ease back until they are almost directly over a selected piece of bottom. As a rule, the biggest blacks prefer the nastiest, snag-infested real estate, so if you aren’t losing some tackle, you aren’t fishing in the right place. When it comes to gear, a 6- to 7-foot, medium-fast rod and sturdy conventional reel should get the job done for most inshore scenarios. It’s important, however, that your reel be spooled with a quality line because blackfish will put it to the test. If using mono, choose one touted as “abrasion resistant” since ‘tog live in such rough environs. Depending on how deep you fish and how strong the current, you can target these fish with lines as light as 12-pound test or as heavy as 30-pound test. The rule is to use the lightest sinker that will let you hold bottom. With braided lines, you can fish heavier because the thin diameter will still let you get down to the bottom easily. Most experts prefer something in the 30- to 50-pound class. As for the terminal end, simplicity is key. Unless jigging, which can be the topic of another article, I prefer a single-hook set-up using a clinch knot to tie a 30-inch leader of 30 – 40-pound-test Ande pink monofilament to a black barrel swivel at the end of the main line, then adding an end loop to hold a bank sinker. I next tie in a pre-snelled, size four, Virginia-style blackfish hook via a dropper loop 6 to 8 inches above the sinker. A neat tip I’ve learned over the years is to add a simple over-hand knot 2 inches above the sinker. This weakens the line so that, if the sinker gets stuck on the bottom, you can break off without losing your hook – or a trophy black that has gotten your sinker snagged. Bulldog blackfish have thick lips, sturdy teeth and no trouble picking up and crushing green crabs. Photo by Tom Schlichter. Finding blackfish and getting your bait to fall right in front of them is only half the battle, setting the hook and hauling ‘em up is the other. The hook-setting seems to be especially frustrating to novice anglers and with good reason. Blackfish, you see, sport two sets of teeth: a pair of buck teeth just behind the lips used for picking meals from their perch, and a molar-like set further back in their throat used to crack and grind the shells of crabs and mussels. When a blackfish picks up a bait, the item is held by the front teeth for a moment, then sent back to be pulverized by the second set. Try to set the hook on the first tap and you’ll pull the bait away. Wait too long, however, and the hook is expelled with the crushed crab shell. It’s a timing thing, hooking blackfish, something that requires practice to get the knack. Keeping a finger to your line to feel the difference between the pick-up and the swallow will help you learn when to make your move. 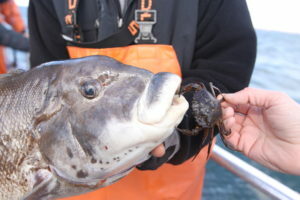 Although blackfish will scoff up clam and worm baits, crabs are a better choice as they seem to limit the number of attacks from pesky bergalls and small sea bass. Many anglers use fiddlers or Asian crabs, but I prefer green crabs because, being large and hard-shelled, they stay on the hook long enough to interest slower, more cautious bulldogs. 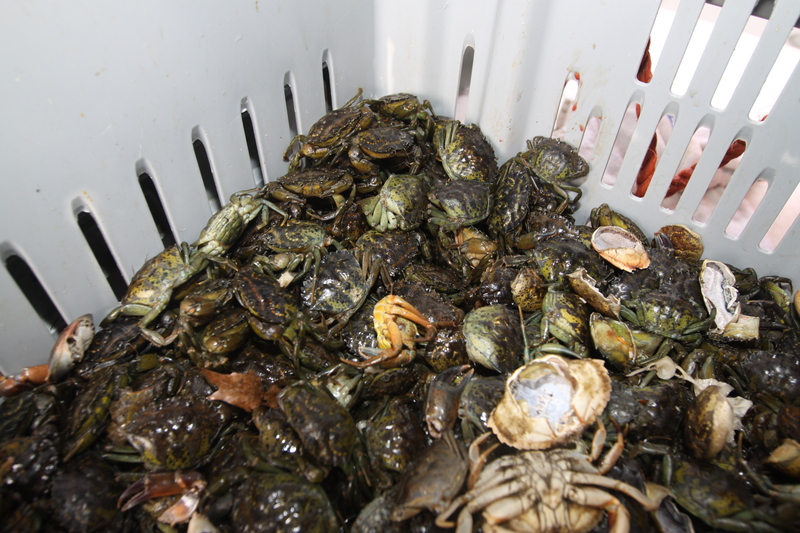 Although fiddler crabs, Asian Crabs and hermit crabs are favored by some, green crabs are still the prime bait on most blackfish trips. Photo by Tom Schlichter. Using green crabs requires a bit of work. Those with shells smaller than silver dollar can be offered whole. To rig these, break off the legs on one side and insert the hook though one leg socket and out another so the point is fully exposed. Leave the legs on the opposite side. Larger green crabs should be split in half or even quartered. Remove the top shell and split the crab from front to back. If it’s a really large crab, divide each section in half again. Now, remove the legs and claws and insert the hook though one exposed leg socked and out another. Again, be sure the hook point protrudes fully. There is another great bait for blackfish but it’s tough to come by: giant hermit crabs. A few stores sell these up and down the coast. Pull them out from their shells and hook each once through the soft-fleshed abdomen. Lower gently to the bottom so they don’t rip off the hook and hold on tight to your rod. If you only have a few, save them for just before slack tide when the current is barely moving. That’s when the biggest blackfish bite best.